How critical is Christianity to the success of Democracy? Some time ago I had a conversation with a Marxist economist from China. He was coming to the end of a Fulbright Fellowship here in Boston. I asked him if he had learned anything that was surprising or unexpected, and without any hesitation he said, "Yes, I had no idea how critical religion is to the functioning of democracy. The reason why Democracy works is not because the government was designed to oversee what everybody does, but rather Democracy works because most people, most of the time, voluntarily choose to obey the law. In your past, most Americans attended a church or synagogue every week, and they were taught there by people who they respected." My friend went on to say that, "Americans follow these rules because they had come to believe that they weren't just accountable to society, they were accountable to God." My Chinese friend heightened a vague but nagging concern I've harbored inside, which is that as religion loses its influence over the lives of Americans, what will happen to our democracy? Where are the institutions that are going to teach the next generation of Americans that they, too, need to voluntarily choose to obey the laws? Because if you take away religion, you can't hire enough police. Dr. Reagan: "If you take away religion, you cannot hire enough police." Mr. Cruz, what is your response to Professor Christensen's statement? Rafael Cruz: What happens is when you destroy, I would say Christianity more than religion, what takes its place is another religion which is called Secular Humanism. Secular Humanism basically says there is no God, for you are your own God. On that premise there are no moral absolutes. As a matter of fact, their mantra is, "If it feels good, do it." Secular Humanism embraces a lot of chaos, a lot of immorality, and a lot of corruption. It causes a situation that deteriorates more and more and more. That's exactly what we seeing happening in America today. Dr. Reagan: You are of the age where we have witnessed in our lifetime the deterioration of America. When I was a kid growing up, we did Bible readings in school. We prayed in school. Our English Reader was made up of Bible stories. We were taught morality. In 1956, when I graduated from Waco High School, on any given day there were a hundred pickup trucks in the parking lot, and every pickup truck had a gun rack. There was a deer rifle, there was a shotgun, there was a 22 rifle, and usually a pistol in the glove compartment. Nobody was worried about those guns being on the school campuses. Today we have moral pygmies killing each other over tennis shoes! This erosion has to do with the fact that we have simply eroded our Christian standards. As that has happened, we have increased violence in the schools. We have violence in society. We see society falling apart. What I can't understand is why people who are non-Christians cannot recognize the connection. Rafael Cruz: What has happened is this so-called religion of Secular Humanism started as far back as 1933. There was a document printed in America in 1933 called the Humanist Manifesto. One of the principle authors was John Dewey who was considered the Father of American Education. He was also a member of the American Communist Party. He was our so-called our top educator! Then in 1962, prayer is removed from school and in 1963 the Bible is removed from schools. The consequence of those two abominable decisions of the Supreme Court was that teen pregnancy skyrocketed over 500%, and so did violent crime. But, the sad thing is the Church remained silent. They called it a political issue. How can you call prayer a political issue? How can you call Bible study a political issue? Dr. Reagan: I remember under the military dictatorship in Poland at one point the government decided they were going to take the crucifixes out of every classroom in Poland, for every classroom had a crucifix. The people went into the streets and declared, "You will do that over our dead bodies!" The Communist regime backed off. In contrast, the Church didn't stand up to keep the Bible and prayer in the classrooms. We didn't speak out. This moral slid has has happened over a long period of time. One of the Supreme Court decisions the just infuriates me is when they threw the Ten Commandments out and ruled that schools cannot even the Ten Commandments posted on the walls of the schools in America. They said the reason is because the children might read the Ten Commandments and decide to obey them. They actual said that in the decision! Nathan Jones: In the Fall of 2015, the Oklahoma City government in the middle of the night snuck the Ten Commandments Monument off of the capital building. Rafael Cruz: The thing that amazes me is that if these Atheist really don't believe in God, why are they so afraid of the cross? Why are they so afraid of the Ten Commandments? Nathan Jones: Because they know there truly is power in the cross. Rafael Cruz: There is power in the cross, and they know it. Dr. Reagan: It's really strange the way things have developed in this nation, a nation that was founded on Christian principles. America is a nation that has been blessed like no other nation since ancient Judah. And yet, we have turned our back on God. We are shaking our fist at God. I think we are just begging for the destruction of God. Rafael Cruz: Absolutely! But, I am still very, very encouraged. I think America's best days are still ahead, because I believe there is a point when the people of God are finally going to say, "I can't take it anymore!" I think the decision on June 26, 2015, to legalize homosexual marriage, I think the Devil overplayed his hand there. Now, all of a sudden, we have a frontal attack on the family, and the family is the fundamental unit of society. It is the very first institution that God created. As the family goes, so goes the nation. In the fourth and last segment of our interview of Rafael Cruz, we'll look at what the Bible has to teach about voting. What is life like living under a Communist regime? Nathan Jones: Mr. Cruz, let's begin by sharing your incredible life story. I want to hear about how you escaped Cuba after living under two dictators. Rafael Cruz: I grew up under a very oppressive military dictatorship. During the seven years Batista was dictator he killed over 20,000 people! The Revolution started in the high schools and the universities. I remember during that time there was this young, charismatic leader talking about hope and change. His name was Fidel Castro. I got involved in the Revolution, and as a result of that, I was arrested, imprisoned and tortured. Even though I did not know God, He knew me. By the grace of God I was able to leave Cuba legally on a student visa. I came to the University of Texas late in 1957 still thinking that Castro was a good guy. Well, in 1959 when Castro took over, I went back to Cuba at the end of the summer. Did I have a great shock, because this same man that had been talking about hope and change was now talking about how the rich were evil, about how they oppress the poor, and about the need to redistribute the wealth. Castro began confiscating private property. He began attacking the freedom of the press. He began attacking the freedom of religion. To give you an idea of Castro's methods, his soldiers would come into a kindergarten class and they would say to the kids, "Alright, kids, close your eyes and pray to God for candy. Where's the candy? No candy." Then his soldiers would say, "Alright, close your eyes again and pray to Fidel for candy." While the kids had their eyes closed, very quietly the soldiers would place candy on all the desks. I mentioned this story a few years ago at a meeting and a lady from Romania told me that Ceausescu did identically the same thing. Communism, Socialism, Marxism — it's all the same, so let's not get caught in the semantics. These ideologies need for government to become your god, and in order to do that, they must destroy the concept of God. That's the motivation for what's behind all these attacks on Christianity that we are seeing today in America. Dr. Reagan: I had the opportunity to go to Cuba a few years ago to teach at a seminary. I have been all over Eastern Europe and all over Russia before Communism fell, and yet I never saw a society so depressed as Cuba. People there just feel like they have no hope. They are living in mass poverty. The middle class was destroyed by Castro. People don't understand that when he came to power he confiscated everything. Rafael Cruz: Absolutely. Most people don't really understand the myth about everybody being equal in Communism. Nathan Jones: Under Communism the people are all equally poor, right? Rafael Cruz: That's right, though there are really three classes. The first is the government where they all live like millionaires because they've confiscated everybody's wealth. Second, you have the army who are the enforcers. Then, third, you have the people. It is true, though, the people are all equal — they all equally starve! Dr. Reagan: When I was at the Cuban seminary, I looked across the street and I noticed there was a little grocery store. Next to the grocery store there was a sign on a door that talked about how this was the neighborhood watch. I don't exactly remember the title of the watch. I asked somebody what this meant and they said that is where the person has his office who watches their neighborhood. They watch everything in the neighborhood. All of Cuba is divided under these watches. If they see anything that changes, and anything that looks like people have some money that they shouldn't have, they report it and get rewarded for doing so. You've got somebody watching you all the time in Cuba. Rafael Cruz: Absolutely, yes, Cuba has a person on every block who is the Castro's spy for that block. Then every six blocks they have one guy watching those six guys! It's all that way across the country. As a matter of fact, Cuba even has food police. Everything is rationed in Cuba. To give you an idea, meat is rationed to a half a pound per person per month. We eat a half a pound of meat in one sitting. But, that is the monthly ration. And, you still have to buy your meat! What happens is people hoard food, or they trade food, and so forth. If the watchers catch you with additional food, you'll be put in jail. They call that hoarding. Dr. Reagan: Mr. Cruz, one of your comments that you make over and over, and I've read this many times, you are quoted as saying, "I am standing up against certain dangerous trends in America, because if America goes the way of Cuba, there's no place to flee to." Rafael Cruz: Absolutely. I must have told my son, Ted, that a dozen times. When I lost my freedom in Cuba, I had a place to come to — America. If we lose our freedoms here in America, where are we going to go? There is just no place to go. Dr. Reagan: Where is there another place like this country that you came to all that time ago, where you, as an immigrant, arrived with $100, and you started going to school, and you were given all of the opportunities that you've had, and then you have a son running for President of the United States? This nation is unbelievable! Rafael Cruz: That is the greatness of America. America is the greatest country on the face of the earth. How dare our current President say that the United States is not an exceptional country. This is the most exceptional country on the face of the earth! Dr. Reagan: President Obama spends most of his time going around the world apologizing to everybody for America. We are the ones after all who in World War II defeated the Nazis, and yet we are apologizing? Rafael Cruz: I love America so much. This is the only country on the face of the earth founded on the Word of God. It was founded by men and women seeking the freedom to serve God. We've seen how God has used America. America has evangelized the rest of the world. In the second segment of our interview of Rafael Cruz, we'll look at how Americans are losing their freedoms. I will now finish analyzing a book written by Robert Cornuke titled, Temple: Amazing New Discoveries That Change Everything About The Location Of Solomon's Temple. This book's startling thesis asserts that the Jewish Temples (Solomon's and Herod's) were located south of the Temple Mount in the ancient City of David and that the entire Temple Mount was the Antonia Fortress where Roman troops were garrisoned. One of the most devastating arguments against Cornuke's theory relates to the size of the Temple platform on which the Temple sat. According to both Josephus and the Mishnah (a collection of rabbinical oral traditions), the Temple platform was 500 by 500 cubits in size. The cubit used by Solomon was the long royal Egyptian cubit which was 20.67 inches long.18 That would make the Temple platform 861 feet square. As you can see, the Temple platform would have stuck out over the deep Kidron ravine, hanging in the sky! 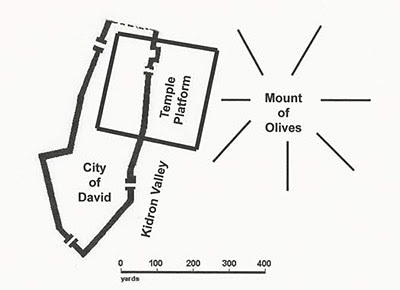 In Cornuke's book, he has some drawings he commissioned showing the Temple sitting in the City of David, but they are very misleading because they are not drawn to scale. One of Christendom's foremost experts on the Temples, Randall Price, agrees with this conclusion. He further observes, "...while evidence of the First Temple's construction is scarce... evidence for the Herodian Second Temple is replete, both in the original documentary sources and the archeological remains. "20 And he then points out that the Bible explicitly states that the Second Temple was built on the foundation of the First (Ezra 2:68 and 9:9). The cover of Cornuke's book has a superscription above the title which reads: "Could History Be So Stunningly Wrong?" The answer is a resounding "No!" 17) Franz, page 23. Also, Randall Price, "Where Was the Temple Located?" 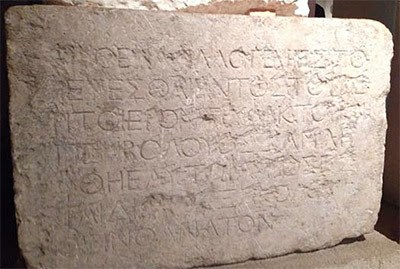 http://www.worldofthebible.com/Documents/Where%20was% 20the%20Temple%20Located2.pdf, pages 8-9. 18) Wikipedia, "Cubit," https://en.wikipedia.org/wiki/Cubit#Ancient_Egyptian_royal_cubit, page 1. 19) The Temple Institute, "The Location of the Temple and the Holy of Holies on the Temple Mount: The Present Dome of the Rock is the Location of the Temple and the Rock Which is Under the Dome of the Rock is the Location of the Holy of Holies," http://templemountfaithful.org/articles/temple-location.php, page 12. 20) Randall Price, "Where Was The Temple Located?" http://www.worldofthebible.com/Documents/Where%20was%20the%20 Temple%20Located2.pdf, page 2. One of Cornuke's cornerstone arguments that he emphasizes repeatedly is that Jesus prophesied that the entire Temple complex would be destroyed to the point that "not one stone will be left upon another" (Matthew 24:2). He then points out that the retaining walls of the Temple Mount remain standing to this day. Therefore, he concludes that the Temple could not have been located on the Temple Mount. In contrast, he points out that nothing is left of the Temple in the City of David. 2) And He said to them, "Do you not see all these things? Truly I say to you, not one stone here will be left upon another, which will not be torn down." Cornuke makes a big deal out of a coin that archaeologists found at the base of the southwest corner of the Temple Mount retaining wall. He says the coin was dated 20 AD and it proves that the walls were not completed by that date. He concludes that the western wall was not built by Herod, and therefore Herod's Temple could not have been located on the Temple Mount. 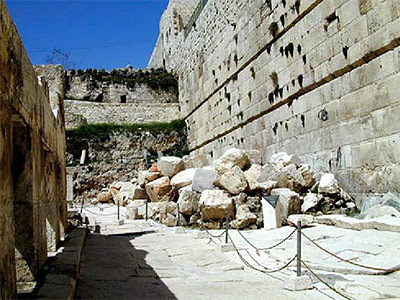 This debris is so deep that when people stand at the Western Wall (or "Wailing Wall") today, they are actually standing 50 feet above the base of the wall where a street was located in the time of Jesus. On the eastern side of the Temple Mount, the debris is so deep that it covers the top of the ancient Eastern Gate which exists directly below the present gate. In the midst of the rubble that has been left at the southwest corner of the Temple Mount is a stone that is inscribed with the words, "To the place of trumpeting." It marks the spot at the top of the Temple Mount where the priestly trumpeter would have stood to sound the trumpet signaling the beginning and end of Sabbath days and festivals. 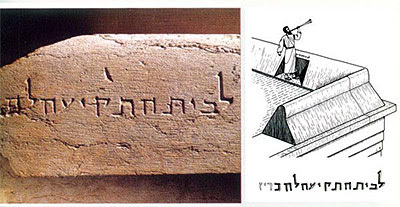 This stone clearly indicates that the Temple Mount was a Jewish sacred place, and not the site of a Roman fortress. In the sixth and last segment, I'll conclude with some devastating arguments against Robert Cornuke's claim that the Jewish temples resided in the City of David. 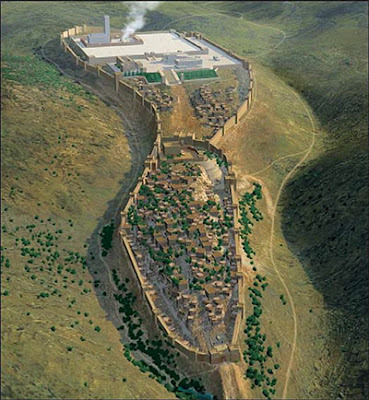 14) Gordon Franz, "Was King Solomon’s and Herod the Great’s Temples Built Over the Gihon Springs in the City of David? : A Factual Review of Robert Cornuke’s Temple," draft article shared with the author by Randall Price, page 19.